I had wanted to write something last night, as it was the last day of the Kemetic Orthodox year. My dsl conspired against me to do any writing on that front. This year has been… I’m not sure. A lot of it has been a blur because of the health stuffs. Most of my energy went to keeping me upright and able to work. The last day of Year 20 was most notable for me in that I felt energetic, had a good belly dance lesson, and had no want or need for a rest during the day. While I know the healing process for me is a mix of ups and downs, the overall bar seems to be getting higher again. I’m curious to know Who will be over the coming year. But I also do not want to rush it. For all that I am not going to the House’s Retreat this year and still working, I want to take something of a step back. Plus tomorrow I need to celebrate my birthday along with Heru-wer. There will be good food, alcohol, and hopefully some time at the beach. That’s almost all of what I need for a birthday now. Stay safe this week, everyone! Tamara Siuda, head of the House of Netjer, my spiritual mother twice over, and Egyptologist, has a Kickstarter project up now to put together a project she has wanted to put out for years: The Ancient Egyptian Daybook. This project is not just meant for those who are in Kemetic Orthodoxy. Anyone with interest in ancient Egyptian festivals will be able to utilize the material included in this book. I also know she is working on additional bonuses because she has already well passed her goal for the fundraiser. It’s the day before Pantheacon. I got in to California last night. Time with people I adore, not enough sleep, some intense talk/processing, and I still need to make up the handout for tomorrow’s Real Food for Pagans panel. I hope to see some of you there! No matter what calendar you use, once you get into the rhythm of a new year it can feel like that year is just speeding away. I can’t believe it’s already been over a month since we in the House of Netjer brought for a big Zep Tepi with Year 20. We’re already into the second month! 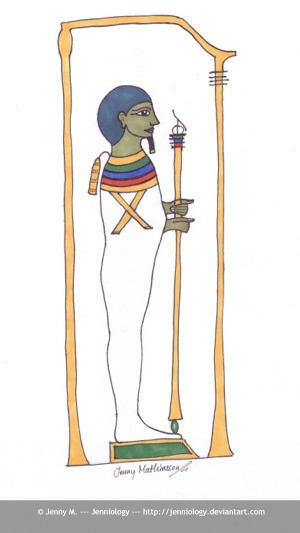 The first day of the second month (2 Akhet) includes a festival for one of my favorite Goddesses, Wadjet. She is the Guardian of the Red Crown, and Lower Kemet. An Eye of Ra, Weret Hekau (Great of Magic), and Arrow of Sekhmet, possibly an Arrow of Bast (UPG according to Shefyt, and according to some sources, the mother of my Father Wepwawet. She is amazing, and along with Her sister Nekhbet (Who is over the White Crown and Upper Kemet), I don’t feel They get enough love. During Wadjet’s festival day I started playing with the idea of what a hymn to Her might be. For all that I seem to be a write, poetry and devotional hymns aren’t a big part of my word crafting. I’ve done one or two short hymns for private use. But the Muse struck me. I came up with something. It may get modified in the future. It might not. For the first hymn I’ve been willing to share, I’m VERY pleased with how it turned out. Strike out against those who would consume our sustenance. Keep the scales of Ma’at even, so that we might live! I woke up at 5am today in order to be ready for the at home rituals and prayers with the sunrise, on this the first day of year 19 in the House of Netjer. 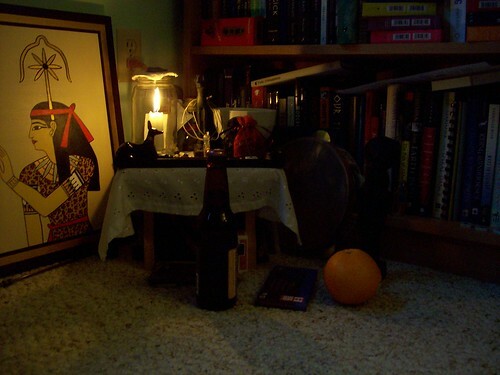 I slayed apep in proxy, gave Wepwawet incense oil (because I can’t NOT give my Father, the Opener of the Way, something special for new year), gave Ptah beer, and enjoyed zep tepi. The day has been a very full one for me, with things I am not going to bore you all with here. If this is how the year is going to go, I am going to be kept on my toes a lot. Figuratively, too, because I was practicing some belly dance moves while on tip toe. This is the fifth year I am entering into as a shemsu of the house, and Ptah is over the year as a builder. We had a creation year a few years ago, with Ra and Khnum. There’s a difference between the two, so far as I can tell. With creation, you can have any level of it, including something from nothing. Building implies tools. Foundation. Things already created and coming together. It’s just the first day. There are many to come, and who knows what they will bring? Hail to You, Builder, Creator! May You watch over my creations this year. May You lend Your stability to my work. Sometimes I feel as though I thrive on adversity. Whenever times are good or easy for me, the feel boring and I don’t know what to do with myself. But present with with some kind of challenge, or put an obstacle in my way, and I rear up, ready for the fight. Right now I face some adversity. On Wednesday, my final exam is due for my last class. Right now, I sit before the computer and write a blog post, with absolutely no interest whatsoever in doing the exam. The temptation to say fuckit sits on one shoulder, whispering in my ear. On the other side sits my nearly completed coursework along with the knowledge that I just need a few more steps before I get that blasted degree. A few more small obstacles to overcome. As much as I’d love to get off the path now, I know I need to complete the walk. One this entry is done, I will be getting to work. Honest. The oracle for the next year has been released. I will speak of it a little more on Wednesday, which will be the first day of Year 19. Once again, zep tepi baby. This morning I offered Set incense oil along with a shot of rum. As I sat at the shrine, words for a possible prayer/hymn started to come together in my mind. What I put together actually pleases me enough that I might use it as a prayer for Him as needed. Strongest of all the Names. May You destroy all that which is unwanted. May You open the way. May You bring forth a new day. In just about a week, Regnal Year 18 in the House of Netjer will end. On 29 July, we shall commence celebration of the Intercalary days, the days between the year, when the children of Geb and Nut were born: Wesir (Osiris), Heru-wer (The Elder Horus), Set, Aset(Isis), and Nebt-Het (Nephthys). This is the second year I’ve not been able to attend Retreat, after going for two years. 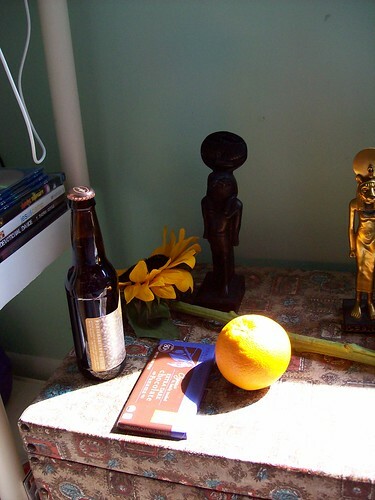 My plan to celebrate solo this year is to make a small shrine in Their honor, give Them each a small offering on Their birthdays (and incidentally, I share my birthday with Heru-wer this year. usually my birthday is a feast day for Min), and contemplate the transition into a new year. This past year has been a year of zep tepi, which is the idea of every new day having the potential of the first day of creation as Ra breaks over the horizon. Making every day a chance to start anew. Perhaps, in a fitting theme for such a year, I am not one whit curious to hear about the oracle for the coming year, or to find out which God or Gods are over the year. That would be looking ahead too far, and not taking in what this day can bring me. I wonder if this lesson will go forward after this year. We can only see what the next day brings. Though I have made a resolution for this year, which I believe I made last year. For this coming year I intend to follow the calendar and acknowledge the festivals as they come. The way I intend to complete the resolution this year is by printing out the calendar each month and checking it when I go into shrine every morning. Often times when hitting this time of year, a lot of people involved in the temple feel like things are coming apart and going nuts. Hence the unraveling. The year is disintegrating and all is going back into sheer potential, waiting for something anew to be woven. Even considering we’re in the shadow of Mercury retrograde, and I was feeling that energy coming up in June, it does not feel like this year is coming apart in quite so dramatic a way as it has in the past. I’ve been giving a lot of thanks for that. Over this past Kemetic year I’ve done a lot, and also gone through a lot. Most notably learning what it’s really like to have anxiety, and get over it. There was also the matter of prolonged stress from schooling. But I can see the light at the end of the tunnel. It’s getting brighter, and I know it’s not an oncoming train. My final class (for real this time, take note university!) is just about done, save for one discussion I need to post. I decided that after I finish this class, I am going to give myself a week or two off from thinking about school, then I am going to work on my final project. It’s a revision of work I did earlier in my schooling, and even though I don’t have a lot of work left to do on it, I want to take the time to make it a very strong piece of work. Once that is done I will just need to do a portfolio and the paperwork for graduation. Then I can call my graduate degree complete. FINALMENTE! Something I have been contemplating over the last few week is the way I experience my Gods and spirits. They usually come in cycles, feeling Their presence at certain times of the month (Hekate), or in specific seasons (The Aesir from Yule to Midsummer, and Netjer from Wep Ronpet until around the time of Wesir Mysteries). This year, the Aesir have not receded. This week especially, I’ve felt both Bragi and Idunna lingering around the edges, just waiting for something. What, I do not know yet. Hopefully They will give me a little time to recouperate before I dive back in to spiritual work. Another practice I started on this spring has been work to better connect with my spirit allies. In what ends up being periods of about four weeks, I immerse myself in the energy of one of my fetches or my familiar (as it has gone so far). As of now I have worked with the spirits with whom I was not so well connected. They were certainly there, but I had never been able to overtly focus on their energies. Having done so, I feel more integrated with my magic and my self. Now that I have time to spare again, I hope to take these practices further and see where they might lead me. Before I started that work I got a very strong message to “be a witch.” That’s a matter for another post. But since I got that message, I have been feeling that witchy quality more. It’s a good thing, like my various practices are coming together into a more cohesive whole. Another step forward. Tamara Siuda, founder of the House of Netjer, has announced the formation of a new network for people of all stripes of Kemetic faith to work together and interact: The Kemetic Interfaith Network (KIN>. This community is open to all, regardless of any affiliations, and includes a forum for interaction. I hope to see you there, fellow devotees of Netjeru! Saturday morning I woke up at Too Early A.M. in order to purify myself and be in shrine before the Sun officially rose. I performed the small at-home ritual for New Year’s morning (but forgot the prayer) and slayed apep in effigy. Took two flushes of the toilet to get rid of all the paper too. 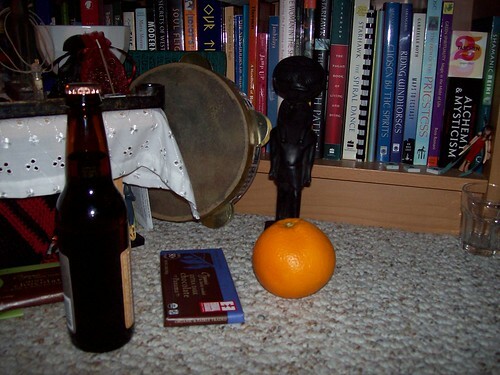 I offered up beer, chocolate, and an orange to Netjer. Later in the morning I purchased a sunflower at the farmer’s market (because even though I had looked at flowers at the store the evening before, I spaced on buying any) and added that to the God of the Year shrine. This year will be an interesting one indeed. I will post and comment on the oracle once it is up for the public to say, but for now I will just say that it is a year where every day is indeed a new beginning and a new chance to live in the moment. To not be bogged down by the past, or to think/worry about what the future will bring. I try to live in this space but often do not manage to do so. My mind is too quick to replay past events or try to plan out/anticipate interactions with others. My resolution for this year is simple: I resolve to become more in touch with the Kemetic Calendar. I will take note of each season as it happens (Kemet had three), do my best to observe the bigger festivals and also stay mindful for the daily holidays as well. Photos. I’m amazed at the first one coming out. For a long time I could not take photos of my Senut shrine without them becoming too blurry for my liking.